This is a significant milestone for the project which will provide emergency services with a new cutting-edge communication system. Engineers performed the test on 8 February between an EE mobile mast site in Bristol and a location in Basingstoke. 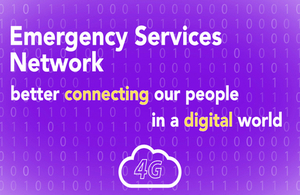 This is the first time Motorola Solutions’ software has linked together with the live EE mobile phone network and demonstrated prioritisation of emergency services communications on a public network. 2This is a complex project which will provide the emergency services with the most advanced communications system of its kind anywhere in the world – which is why successful tests like these are an excellent achievement. "Members of the public are already seeing some of the incidental benefits of the project like its improvement of the 4G mobile network – 90 per cent of the UK is now covered."